Micro-chip all horses for identification purposes and tracking. Land has been identified in Breathitt County that can provide temporary “sanctuary” to horses while they are being processed. The location is easily accessible and is in close proximity to an estimated 500 horses that have either been dropped off or have been temporarily placed in these areas by their owners and need to be identified as such. The landowner has expressed the desire to assist if the issue of liability is addressed. The Breathitt County Fiscal Court are in support of a temporary “sanctuary” being established in their county. Educate the public of this situation through this website and other media sources. Inventory all horses to identify which have owners and which are in need of homes and assistance. 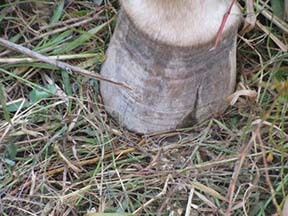 Feed horses when food sources are scarce and during the “housing” process of “taking up” the horses. To this end, emergency funds have been requested to provide hay for the horses to get them through the winter and early Spring months when food is scarce. Cover vet costs for coggins testing, health certifying each horse and other horse-related expenses including but not limited to worming and hoof care. See Veterinary Health Care Assistance for more on this. Micro-chipping all horses for identification, processing, and tracking purposes. Legislation needs to be introduced during the 2015 legislative session therefore “champions” for the cause need to be immediately identified and educated on the issue. Liability protection for property owners providing temporary holding area and/or “sanctuary” to horses. Kentucky’s stray holding time should be reduced. Kentucky has the second longest stray holding time in the United States. Ninety percent (90%) longer than most states. Click here for state comparison. According to KRS 259.130, a person “taking up a horse” is required to house the animals for ninety (90) days prior to allowing the horses to be adopted. This is both labor and cost-prohibitive. The time required and the method/description of housing should be revisited. Provide property owner protection from liability issues. If a landowner agrees to allow horses to temporarily stay on their property while the horses are being identified and processed, that same landowner shall be protected from any lawsuits should one of the horses get hurt on his property and/or cause damage to itself and/or others upon leaving said property unless the landowner willfully and with malice, caused the damage. Because overgrazing by these abandoned horses often results in weak ground cover, ground cover requirements should be lessened for those properties still bonded that provide pasture area to horses during the holding process. Noted: A formalized agreement with landowner(s) that relieves them of liability in return for the use of their land is needed. Click here for Morehead State University’s White Paper on “Health care considerations for unwanted horses in eastern KY's reclaimed coal mine sites”.